River Radio Boys at work! 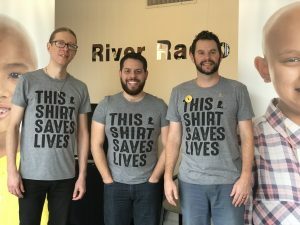 Our River Radio guys are working hard for the kids of St. Jude today – ready to take your calls and make you a Partner In Hope! Plus, you’ll get one of these snazzy shirts of your own! Brad Smith represents the Cape PD for St. Jude! War Child Biker Club makes large donation to the kids! ‹ Laura Wibbenmeyer – KFVS12	› We Raised $121,640!